The Fox Four Theater was located at E. 51st Street and S. Harvard Avenue and went through a number of names. It started out with a single screen 2,000-seat theater and was twinned and then quadrupled. It originally featured a Cinerama auditorium. The last film shown on that screen before it was twinned was “2001: A Space Odyssey”. In its history it was operated by National General Corp., Fox Midwest Theaters and General Cinema. The building now operates as a tanning salon and gymnasium. I worked with Blake Smith at the Fox 4 Cinemas for a time as projectionist. I really admire how they were able to take the twin theater and make it into 4 screens. The twins were simply cut right down the middle length wise and theaters with about 100 or so seats were created. It was a rather nice second-run house. The theater itself was never actually demolished. The building itself still stands today, only as a gym. I was an usher at the Fox from 1967-1969. I was popular at Kelley as I had free access to “2001”! Stoned hippies used to come in during the last 30 minutes to lay down in front of the giant Cinerama screen and zone out! I miss the Fox and the wonderful people I met there. What ever happened to Mr. Nichols??? Here is a late 1960’s photo of the Fox Theatre marquee as it originally stood to advertise a single screen, 2000 seat theatre. Thanks guys for the great ad 2001,and the pictures. Real Theatres,my friends,not 20 plexes! I worked in the district office for Mann Theatres out of Wichita, KS and remember when this theatre was twinned. 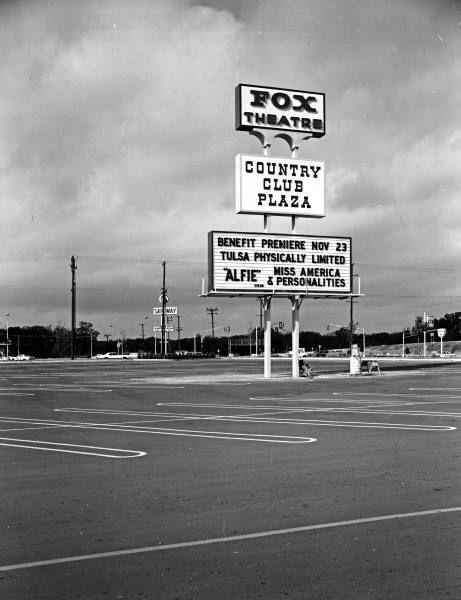 I never saw it, but from the pictures the marquee looks very similiar to the Fox Garvey in Wichita, which was also an NGC house.